Print on BOTH sides of the tube banner, the same or different artwork! 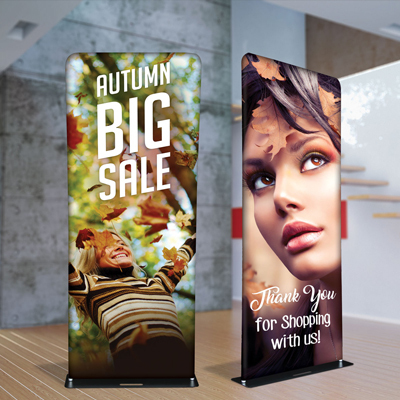 The light frame and elegant wrinkle-free, no-glare, fabric provides a different look to indoor spaces, making any promo look far more sophisticated than vinyl banners. Fabric Tube Displays come equipped with a portable carrying case to store the stand’s parts and make travel and setup a breeze. Available in 24"x90", 36"x90" and 48"x90" sizes. contact us for your size template.